Breast cancer has been steadily increasing in New Zealand over the last 30 years and as a comparison presents a far greater health issue than cervical cancer. The breast cancer death rate has reduced 19% over the last decade. This reduction has been mirrored internationally and is believed to be due to the use of adjuvant treatment. 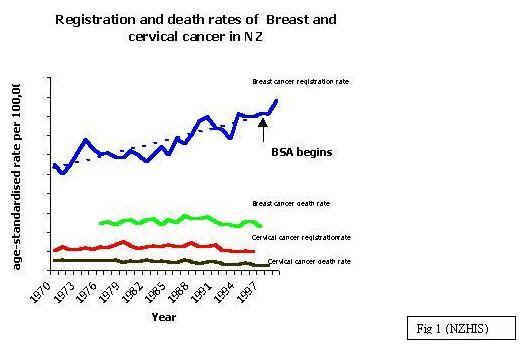 BreastScreen Aotearoa (BSA) began in late 1998 and as a result of increased early detection, the 1999 registration rate increased sharply (Fig 1). There was an 8% increase in the registrations from 1998 to 1999, which is directly attributable to increased diagnosis in the BSA target age group 50-64 group (Fig 4). Cervical cancer does not have the same impact as breast cancer; almost 10 times more women die of breast cancer each year than cervical cancer. Breast cancer becomes more common as women age and as NZ has an ageing ‘baby boomer” population, in the next decade we will see large numbers of women diagnosed with breast cancer. 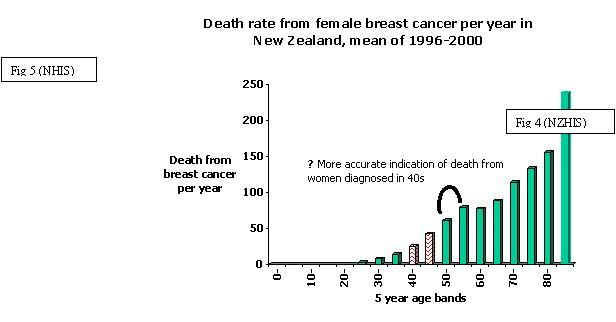 New Zealand’s breast cancer incidence is similar to Australia. However, Prof David Skegg when he compared the 2 countries concluded that NZ women have a 28% greater chance of dying of breast cancer compared with Australian women (1). BreastScreen Australia began in 1991. Screening mammography has been offered to Australian women in the 40-49 yr age group since the outset and although this group is not actively recruited, 20% of the eligible group has mammography through the Australian programme. It is impossible to tease out as to why women with breast cancer in New Zealand have a greater chance of dying of their disease compared with their Australian counterpart. Improved survival for those women who have screening mammography in the 40s is just as valid a reason as is more effective and timely treatment services. 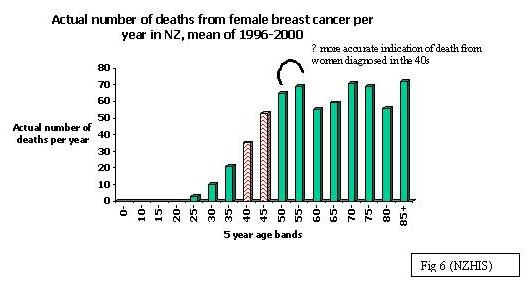 Of the over 2000 women diagnosed with breast cancer annually in New Zealand, 20% are in the 40s. In comparison, women in the 50s accounts for 25%, women in the 60s - 21%, women in the 70s -16% and women 80 and over accounts for 13%. The proportion of women who are diagnosed in the 40s is not an insignificant number (Fig 2). Breast cancer is more common as women age and this is reflected in breast cancer registration rates over the last 5 years of available data (1997,1998,1999,2000,2002). 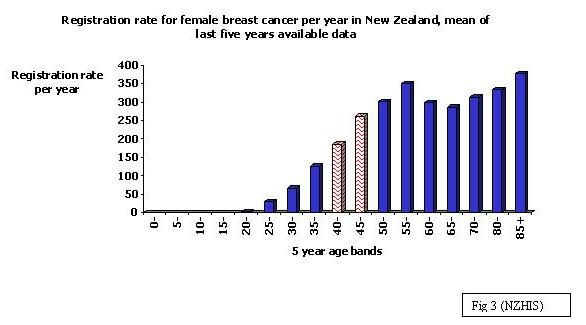 However, it is important to note that this data is inevitably skewed; the introduction of BreastScreen Aotearoa for women 50-64 years in late 1998 resulted in a marked increase in the registration rate, which is directly attributable to increased diagnosis in the 50-64 group. (Fig1,3,4). The skewing of the data for women 50-64 year with the introduction of BSA serves to understate registrations in 40-49 age group. The actual numbers and death rate from female breast cancer reflects the increasing registration rate; it is an established fact that breast cancer is more common as women age. 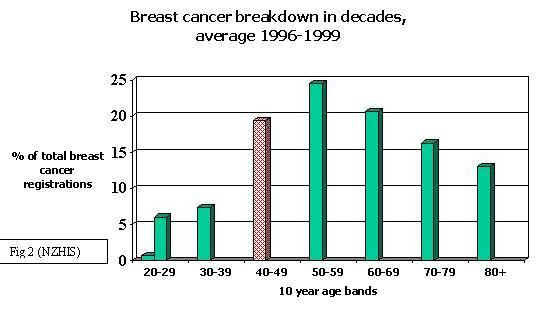 In 1999 for women in the 40s and 50s, breast cancer by far is the commonest cause of death in these respective age groups (NZHIS). For the 30% of women who die from this disease, death from breast cancer may be some years after diagnosis and therefore death rates of women in 40-49 age group more accurately reflects those women diagnosed in the30s. Similarly the death rate for women in the 50s may more accurately reflect those women who were diagnosed in the 40s. The sharp increased breast cancer death rate in women 85 years and over may reflect the difficulty in establishing an accurate cause of death in this age group (Fig 5,6). Since June 2000 the Auckland Breast Cancer Study Group (ABCSG) have reviewed data from all breast cancer cases occurring in the Auckland region, Currently 1800 consented patients are recorded on ABC register. 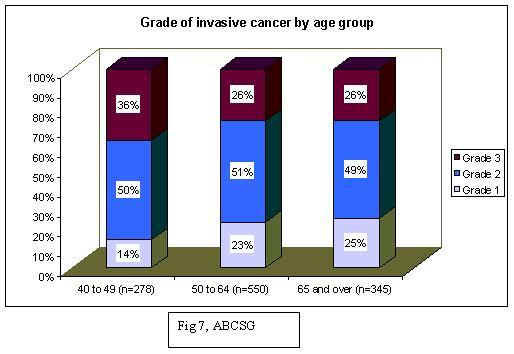 The ABCSG data confirm that women in the 40-49 yr age group have a 10% higher rate of the most aggressive tumours (Grade 3), than women over 50 years. This data is consistent evidence that cancers in premenopausal women are faster growing and more aggressive than in post-menopausal women. It is for this reason that women 40-49 require annual mammography compared with 2-yearly mammography for women over 50 years. Over 75% of women in the 40-49 years age group presented with a palpable lump, compared to 43% of women eligible for screening. 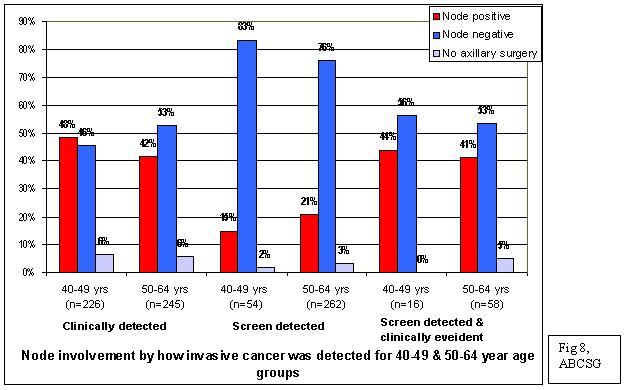 This data also demonstrates that clinically detected or palpable cancers have a higher rate of lymph node involvement, which is 6% higher in the 40-49 age group compared to clinically detected tumours in women eligible for screening. Lymph node involvement is a negative prognostic indicator. The standard arguments that have continued to be used against screening women in the 40s are flawed and no longer can be justified. 1. Women in the 40s have dense mammograms. Therefore cancers will be missed and there will be more false positives. There is no magical change in mammographic denseness at age 50 years. Over time, breast tissue gradually becomes more fat replaced. At age 30 years approx 90% of women have mammographically dense tissue and this changes by 1-2% per year such that at age 65-70 years, 60% of women will have fat replaced breast tissue. As such, there is no significant difference with regards to mammographic denseness when women 40-49 and 50-59 are compared. Breast cancer is more common as women age and when this is taken into consideration, recent Australian data from BreastScreen Victoria confirms that cancer detection rates are comparative and recall rates from screening mammography are similar. The recall rate for first time attenders is within the recognised international and BSA target for both groups (2, Fig 9,10). The recall rates for subsequent attenders for both women in the 40s and 50-69 yrs is slightly outside the international and BSA target. It is a credit to BSA that lead providers consistently meet stringent BSA targets for women 50–64 yrs and because of the quality of providers in NZ would be able to meet targets for women 40-49 yrs. Of note, Victoria (Australia) has a similar population to NZ. 2. Mammograms in the 40s will make women anxious – refer to submission Danute Ziginskas, Clinical Psychologist. 3. The risks and harms of mammography in the 40s outweighs any benefit. Other risks of screening mammography include cancers that are detected but whose outlook is unaltered by an earlier diagnosis and over-treatment of abnormalities such as ductal carcinoma in situ (DCIS). There is no simple way to compare the risks versus the benefits; they will be perceived differently by different women. 4. The benefit of screening appears delayed in younger women. The delayed benefit is because a woman has turned 50 and screening should therefore start at 50 years. It is not clear why the benefit is delayed in younger women or indeed what the significance of this is. Possible factors that influenced the apparent delayed in benefit of screening are that younger women having faster growing cancers. Importantly all the controlled trials had variable screening intervals (12-33 months) and we now know that women in the 40s need annual mammography. Experts believe that if the correct annual screening interval had been applied to this age group, the time it would take to see the benefit of screening would be similar to the 50 and over age group (4-5 years after screening begins)(3). Importantly the window of opportunity to prevent death from breast cancer may occur early in its growth even though it may not be fatal for many years. Over the past thirty years there have been eight controlled trials looking at whether regular screening mammography reduces the number of women dying from breast cancer. The eight controlled trials varied in recruitment of participants, age groups screened, the time between mammograms or screening interval, mammography protocols, control groups, and size. Only one trial specifically looked at the 40-49 year age group (Canadian CNBSS-1). The Canadian trial is now considered by experts to be flawed due to selection bias of the screened group. Over time there has been intense review and re-analysis looking at different combinations of the controlled trials. In 2002, the United States Preventative Services Task Force (USPSTF) analysed all the trial data to date and when the Canadian trial was excluded, determined that there was a 20% reduction in breast cancer death in women who have screening mammograms in the 40s (4). This is worst-case scenario. Tabar has emphasized that the meta-analyses of women in the 40s underestimates the benefit of screening (5). In contrast there are individual trials such as the Gothenberg trial, which showed a 42% reduction in breast cancer mortality for women 40-49yrs (4). However, it is believed that if a theoretical annual screening interval to the 40-49 yr group, the reduction in breast cancer death is thought to be at least as good as and may even be better than the over 50 year result of 30% reduction in breast cancer death. For instance, the Gothenberg trial (6), which screened women 40-49 yrs every 18 months, showed a 42% reduction in breast cancer death. Not all women invited for a screen had a mammogram but these women are included in the calculations. It has been theoretically calculated that if 100% of women had a mammogram the reduction in breast cancer deaths would be 55% and if the women had an annual mammogram the reduction in mortality would be as high as 73%. An analogy to breast cancer development in women in the 40s is like a snowball rolling down a mountain. Just as a snowball gets bigger and gains speed, breast cancers in the 40s get more aggressive and bigger (potential for dedifferentiation or worsening of malignancy grade during tumour growth). Tabar estimates that 8 breast cancers out of 10 (81%) have the potential of dedifferentiation in the 40-54 age group, while this figure is one out of two (50%) in women aged 55 and older (5). Importantly when a young woman in her 40s is saved from dying from breast cancer there is more life-years saved compared to an older woman. In New Zealand since 1992, the numbers of live births for women aged between 35-45 years has doubled from 10% of the total live births to almost 20% (7). The social fallout to the family is huge when a young woman dies. The actual benefit from breast cancer screening is primarily important to the individual woman who is interested in reducing her risk of dying from breast cancer. Women in the 40s must have the absolute right to make an informed decision and be offered choice. Countries such as Australia who are currently offering half pie screening in the 40s but not actively recruiting this age group need to get off the fence. New Zealand has an opportunity to be a leader and not a follower in women’s health. (6) Bjurstam et al, Journal of the National Cancer Institute. (22): 53-5, 1997.